Banmiaozi Jinying Gold Mine is a large underground gold mine, which is also the flagship mine of international gold mining giant Eldorado gold company. Since the introduction of wireless remote control system in March 2009, the total output of the mine has reached 100 thousand T which also plays an important role in reducing the amount of picking and cutting, reducing the labor intensity of the workers, ensuring the safety of the mine. Underground LHD loader is a kind of loading, transporting and unloading equipment, which takes Diesel engine or motor (powered by towing cable) as the prime mover. Meanwhile, it has notable features, such as hydraulic or hydraulic-mechanical transmission, articulated frame, tyre walking and front unloading bucket, etc. Underground LHD loader is the main equipment for underground mining operation, which has the advantages of high efficiency, flexibility, mobility and low production cost. It is widely used in underground mines and underground tunnels and chambers and other projects. According to the power source, the LHD loader can be divided into diesel powered LHD loader and motor powered LHD loader; According to the bucket capacity, LHD loader can be divided into small (bucket capacity≤1.5m³), medium (2m³≤bucket capacity≤4m³), large（bucket capacity≥4m³). In the event of an emergency or when non authorized personnel is operating the equipment, the relevant personnel can be authorized to use the emergency shutdown remote control in a safe distance to stop the equipment. After activation of the remote control transmitter, the transmitter sends a signal to the receiver of the device to shut down the engine, and applies the parking brake in the adjustable delay time. When turning off a device, the operator can simply identify the number of the device, enter the remote control by pressing the key and press the send button, and then easily achieve the purpose of braking equipment. Emergency stop remote control features: Able to control up to 10 thousand devices, any key can start the transmitter, automatic sleep mode can extend battery life, parking development delay time adjustable, the software automatically detects faults. Its advantage is to reduce the risk of emergency situations, improve the overall safety level, when emergency shutdown is needed, to reduce potential equipment damage, emergency stop equipment can realize unmanned operation, stop the unauthorized use of equipment. Visual range remote control is to solve short-term, a small number of production tasks, such as site clean-up, ore mining, slope maintenance and other safe and efficient ways. Safe operation distance between operator and remote control equipment is 5 to 200 m (in the absence of any obstacles around the surface, can reach up to 2000 m). Because the operator is limited by the sight,and under sight control, the distance between the operator and the equipment is close, so there is a certain security risk, so it is necessary to use the remote control correctly to ensure the safety of the operator. Features and advantages of visual range remote control: The use of safe, easy to operate and maintain, high risk and low risk production tasks are applicable, humanization design, the operator can work comfortably for a long time, the operator can achieve a variety of operation functions the equipment in the same position. The disadvantage is that the device relies heavily on operator's judgment ability, operational skills and experience, The technical requirements for personnel is relatively high, there is also a certain security risk, so the appropriate security measures and the corresponding standard operation procedures is absolutely needed. 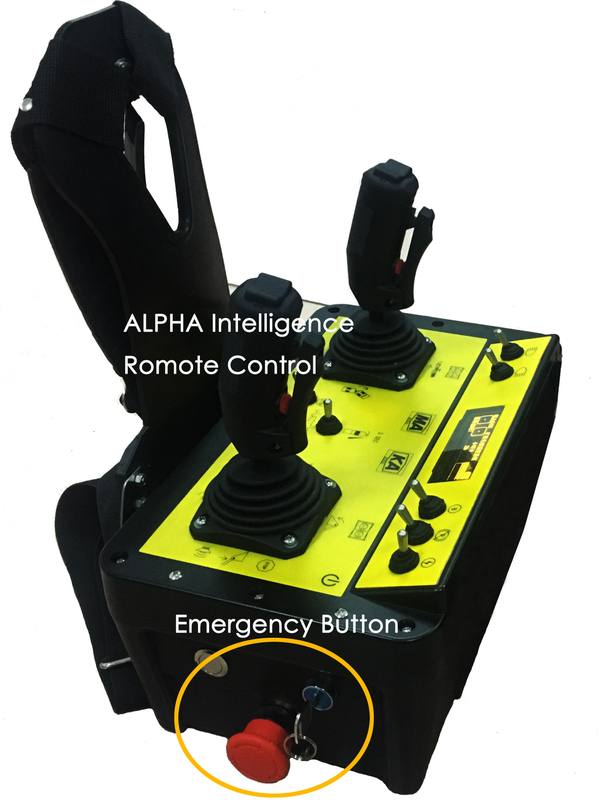 Compared with the visual range remote control, the video remote control is more suitable for the mining of ore in the restricted space. Taking into account the stability of the underground environment and the instability of rock conditions, remote control can be achieved through the camera and monitor screen. At the same time, the video remote control system can be equipped with the guidance system to realize the semi-automatic operation of the equipment. The guidance system can reduce the damage of equipment and improve the overall operation efficiency while increasing the running speed of the equipment, which can keep the LHD loader in the best lane road position, and help avoid collision with the side and obstacles. The characteristics and advantages of video remote control: long-range remote control operation can be realized, to avoid that the operator and equipment get too close; The monitor can also display the front and rear screen of the LHD loader, and can grasp the running state of the equipment in real time; The video remote control system is easy to carry, it is easy to replace the video remote control position; The overall safety level of the site is high. The disadvantage is that the underground tunnel network requirements are relatively high, one-time investment is relatively large, etc. Jinying Gold ore body is buried shallow, and the stability of the ore rock is moderately stable. The rock hardness coefficient is 6 ~ 8. The dip angle of ore body is mostly 40 ~ ~ 50 degrees, which belongs to gently inclined ore body. The trend of the ore body is mainly from the north to the East,Southeast tendency， and the dip of the ore body is 6 ~70 m, and the strike length is 110 ~ 500 m. Because the ground is not allowed to collapse, the sublevel open stoping backfill mining is used. In the process of mining, along the direction of ore body， every 20m there are partition pillar and room, first do mining in room, after backfilling of mining room, then do pillar backstoping. The width of the stope is the horizontal thickness of the ore body, the height of the stope is 15 ~ 60 m, bottom ore drawing structure is not set up on the middle part of ore drawing. After blasting, the stope top exposed space will reach 600 ㎡，for the effective safe distance of ore in mining area is 5 ~ 10 m, if the drawing distance is beyond 10 m, then LHD loader and operator will be exposed to the goaf, the security risk is very large. In order to ensure the operator's personal safety, Jinying Gold mine introduced the remote control LHD loader, when ores are outside the safety distance of 10m, remote control LHD loader is used for ore drawing. The underground LHD loader introduced by Jinying Gold mine is R1700G from CAT company, with bucket capacity of 5.7 m3, the weight of 50 t and is diesel powered internal combustion LHD loader. On the basis of present situation of the underground tunnel network and the size and shape of the stope, the second generation remote control system of RCT company-Control Master 2000D is adopted. Control Master2000D series remote control system consist of transmitter, receiver and electrical interface. The operator uses the transmitter control device, the transmitter is portable, easy to carry, battery powered. The operator can move around, adjust their angle of view, to ensure the normal operation of LHD loader transport and unloading. 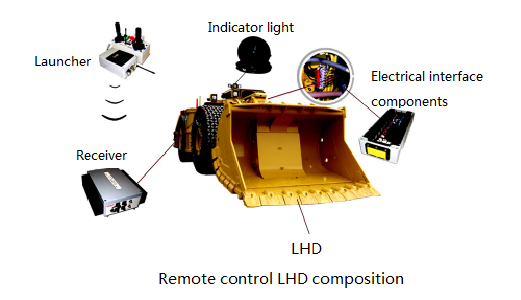 Although the remote LHD loader avoids the direct contact between the personnel and the mining area, effectively protects the personal safety, however, because of the remote control of visual range, the working condition of the LHD loader in the mining field needs to be closely observed by the human eyes. 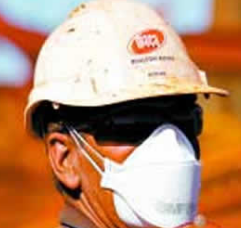 So, it is necessary to ensure its safe operation through a series of safety measures and operating procedures. 1) Remote chamber. A remote control chamber is opened on both sides of the ore drawing line outside the 10 m of the stope, which is used as the control room for the operator to remotely control the LHD loader. The remote control chamber specification (width * height * depth) is 2 m * m * 2 m, the chamber surface is higher than the bottom of the mine road at least 0.5 m.
2) Laser shielding instrument. A laser shielding device is arranged at the entrance of the remote control chamber to separate the working area of the remote control LHD loader and the area where the operator is standing. Once there is operating error or remote control LHD loader is out of control, which may cause that the LHD loader body hit the laser line, the LHD loader will immediately turn off, automatically open the wheel brake system, forming the locked state, to prevent further movement of the LHD loader operator which may cause personal injury. 3) Rescue facilities. The tail of the remote control LHD loader is matched with a rescue ring which can be dragged and led by an external force, Once the LHD loader is damaged in mining area by the external force damage or just mechanical failure itself, remote control LHD loader will immediately brake flameout, automatically locking, remote connection between remote control LHD loader and operator will get disconnected. A rescue hook is also needed in bucket part of the front part of another remote control LHD loader, operator remotely control LHD loader to the end of the trapped LHD loader,and open the hydraulic switch with the hook top, then loosen the brake device of the LHD loader, and connect the hook with rescue ring, finally drag the trapped LHD loader to safety area for repair and recovery. 4) Safe operating procedure. In order to protect the personal safety of operators, with all the hardware security protection measures equipped, remote control procedures are also need to be established. So that each operator can be clearly aware of the security drawbacks brought about by limitation of remote control system, including how to do LHD loader pre-start inspection, and how to switch LHD loader artificial - remote control state. Only after equipped with the corresponding hardware and software security facilities, the operator can safely and effectively carry out the mining operation. Since March 2009, Jinying Gold mine beginning to use remote control LHD loader to do ore drawing operation, with the improvement of safety standards, the ore drawing proportion of remote control LHD loader is increasing, which is close to 60%. The remote control of ore drawing plays a more and more important role in improving the safety level of ore drawing operation, reducing the labor intensity of the workers, reducing the cutting capacity and improving the recovery rate of the stope.